China is the world’s largest producer of abamectin. In China abamectin is also the most widely produced and used biopesticide. 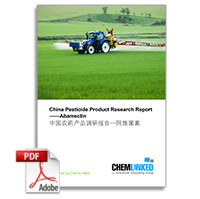 More than 2000 pesticide products containing abamectin as the active ingredient are registered in China. The vast majority of registered formulations are emulsifiable concentrates in addition to the dozens of technical grade active ingredient registered. As the main manufacturer of abamectin in China, Hebei Veyong has a production capacity of 350tons per year. The over production and low price of abamectin were corrected by inspection and supervision over abamectin production, however abamectin waste-liquid has not been banned in the production of abamectin EC.